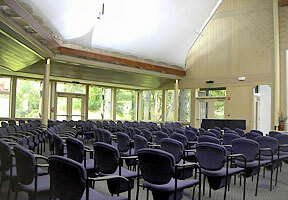 Adat Shalom designed their facility to use an ample amount of natural light - shown here in their sanctuary. Eight years ago, Adat Shalom, a congregation of now some five hundred households, built a new, "green" synagogue on land it had acquired (with an existing prairie-style home). The project resulted in a sanctuary, Torah school, social hall, library and administrative offices. 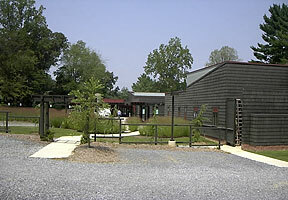 "The first thing to know about Adat Shalom, and therefore about how we approached our new building," says Rabbi Fred Scherlinder Dobb," is that we are a Reconstructionist congregation, part of an American movement that balances the social engagement of Reformed synagogues with the religious traditions of Conservative Judaism. Maybe most important, Reconstructionist congregations are very intentionally vibrant micro-communities for all the families involved. "So when you ask me what was best about our building process, my first response would be: the outcome. Don't underestimate just how gratifying a green building will be for your community. The entire project from start to finish--and including now using our new space--has built community. In this way, the true value goes far beyond our building itself…as much as we value the building. At Adat Shalom, we pride ourselves on creating an intentional community. The ethical and environmental criteria of the project were front and center, and helped us as a community to live our values, literally to concretize our values." In addition, one of the best outcomes for Adat Shalom, and one which should be true for many congregations that undertake green building, has been a growth in membership. Happily, Rabbi Fred sees that new members have not only been attracted by the principles underlying Adat Shalom's new building, they have also been active within the congregation in ways that reflect those principles. What was most disappointing aspect of the project? "Falling short, if only by a little, from our goals," replies Rabbi Fred. "For example, we'd intended to use--and had arranged for--century-old logs reclaimed from the bottom of Lake Superior to flank our entrance…something that would have symbolically evoked the entrance of the Temple in Jerusalem 2,000 years ago. Well, they didn't come and they didn't come. The day arrived when our builder told us we'd have to have them in one week. It wasn't possible, and so we had to cut down some wonderful virgin timber for the entrance…just the place where we would have wanted to demonstrate the ethos of the entire project." 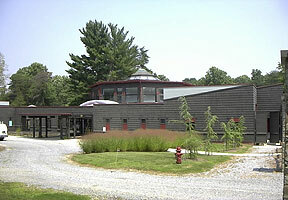 Adat Shalom used as little asphalt as possible for their driveway and parking lot. This allows the earth to absorb stormwater runoff, and helps keep local water supplies cleaner. Rabbi Fred then provides another example of how in the course of a major building project, you sometimes have to accept the good in place of the perfect: "We knew we needed to have a durable, easily cleanable floor for our social hall, where, among other things, there are many children's meals served. We also knew, having seen Judith Helfand's film "Blue Vinyl," that we didn't want vinyl. And we chose not to pursue linoleum, even though it would have fit with our green goals, because it would have cost $80,000 more. So, we got flooring which, when it was installed, we discovered had 7% vinyl in it, although that included some reclaimed vinyl. So, it was good…but not as good as we'd have liked it to be." For Rabbi Fred, the most difficult aspect of the project was also the most important. "We began the project by first educating ourselves--meaning all of us in the congregation--about building ethics and environmentalism. We then did a survey about what we wanted in a new building. What we came up with--sustainability…affordability…an aesthetic of simplicity…sufficient size to support our programs…lots of natural light and views to the outdoors--turned out often to be in tension, one with another! For instance, to get more natural light we needed lots of windows, which have far less R value (insulation value) than a well-made wall, and are much less energy efficient. That was even more true in 1999 when we were getting underway. "So, coming out of our experience, one thing I'd strongly suggest in this regard is that a congregation undertaking a building projects create a clear, values-based document that establishes criteria for decision-making throughout the project. You've got to make more decisions than you could ever imagine and, over the course of the project, they've got to be made by more than one person or group. My sense is that the theological context that we established for our building was woven through all our process and decisions. I think people just got it and felt it strongly"
What are good ways to insure that the entire congregation is informed and enthusiastic about a green building project? "When we started I was a freshly-minted rabbi in his late 20s," says Rabbi Fred. "I handled raising the consciousness of the congregation mainly through sermons, classes and newsletter articles. All fine. If it were today, though, I'd help facilitate such learning far more widely and from many other sources…from the board of trustees to the youth education program...and from such activities as field trips and hands-on experiences…what I'd call pedagogically lasting modalities. "Also, I'd make it far clearer to everyone involved what the fundraising potential is for a green building. Although such a thing is difficult to track, anecdotally it's clear that we raised perhaps as much as 10% more because of the greenness of our project. By the way, I'd also advocate that where your homework demonstrates significant ongoing operational savings, over say eight years or so, that you add that right back in to your budget for additional greenness…paying for it with a low cost loan. Out of a total budget of about $6.5 million, we raised just under $4 million, and took out a mortgage for the rest. That mortgage is not without some ongoing burden, but my sense is that the members feel it is well worth it for the building we have. Adat Shalom used native plants, which require less water and are more drought-resistant, as part of their green landscape design. "When I give tours of our building, I always make the point that what we did was eight years ago. Cutting edge technology has moved ahead; others should aim to leapfrog us. It feels good to be catalytic in that way. One place that's really done that is the Jewish Reconstructionist Congregation of Evanston, Illinois (JRC). It's interesting to see that ways in which its new synagogue building demonstrates what's possible today. There are expanding markets for sustainable materials, and JRC managed to incorporate 50% sustainable wood, as well as minimizing the use of wood by turning to materials such as recycled plastics. 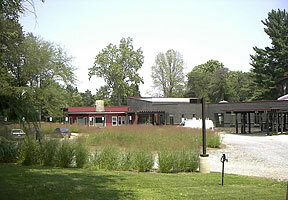 JRC also created a very tight, energy-efficient exterior to their building, their building envelope. It did so by taking advantage of its tight urban environment in creating a three-story rectangular building, which reduces the ratio of building 'skin' in relation to cubic space inside. It also allows ample delighting with less window area. In addition, JRC used the latest in window technology. Finally, JRC made a real commitment to using locally produced or processed materials. I admire what they've done. And I'm not alone. They've just received the very first Platinum designation for a religious institution ever granted by the US Green Building Council. "Finally, we feel strongly at Adat Shalom that a green building is not just about our health, or even its impact on the natural world. It's also about the people who live all around us. So a green building must be an ethically just building. One way we did that was to use union labor or, where that did not make sense, to provide pass-through financing to sub-contractors which they were obliged to give directly to their laborers so that their pay was a living wage. What we did was to use experts in labor costs--people we located through our human network -- to find out what the workers pouring our foundations or other tasks were likely making. Then we'd negotiate with the subcontractors to pay them more money! When their eyes un-widened, they were actually receptive and respectful of our approach. In this way we were trying to widen the circles of social consciousness to our vendors and contractors. As Judith Helfand has said, 'Don't just build a building. Build a just building.' Amen to that!"